Well it’s 3 days into February and I have put up a few good days of numbers. 12,900, 9,900, and 13,600 today. As I get closer to starting my new work next week I wonder how my daily step count may change. Hopefully it will go up and I will not need to be walking a mile on lunch like I currently have to do. As always thanks for reading. Please share and re-tweet. I should really say 313,614 steps down 5,686,386 steps to go!! So as you can see from the picture I have a lot of things to be proud of this month, and a few to work on. Yes, I didn’t achieve my planned 11,000 step average but coming in at 10,000 steps is still a great achievement. Consider this, my 4 rest days where I didn’t do anything were about 3,500 steps average. If you take this as a better gauge of my average steps without doing workouts this means that I would have only had about 108,000 steps normally and it would have taken me until near the end of March to walk the number of steps that I completed this month. Moving forward this month I am planning to try and average about 12,000 plus steps a day. This is my stage wise approach to trying to get my average step count in the 18,000 to 20,000 step range for summer to make up for these first few months. Note: 6 million steps is an average of 16,000+ a day for the year. One rule that I am going to make for myself for this month is to only take one “rest day” a week and all rest days need to be at least 6,000 steps. As always I welcome people’s comments and encouragement. Thank you to my new WordPress Followers, and thank you to all my Facebook / Twitter people that come to read my posts. I ask of people to please take time to share / re-tweet my blog to your friends and ask them to do the same to help me build a bigger following and eventually help others in their own life journeys. 2016 is certainly becoming a year of change. First this challenge to myself and all the steps I am taking and now also changing jobs. Before I get into some thought though I want to acknowledge my first official followers on WordPress. So Thank you to Tony and Joelle for following me. I ask people that read my posts from Facebook or Twitter to also check out some of their great posts. I think this quote that is in the first picture is probably the way that I felt when I initially decided to do this challenge. 6 weeks ago I was at the point in my life where my depressive demons were certainly pushing me. Also the depression over what I had gone through with surgery and now not loosing weight was very heavy on my mind. I might not be seeing the weight loss but I am certainly seeing the change in my overall activity level. If you told me 4 months ago that I would be walking nearly 4 miles every day as exercise I might have told you that you were crazy and thinking of the wrong man. Well looking back over the last couple of weeks I would say I am doing about 50% with my challenge. Some of you whom are reading might say that is very low considering all the steps I have taken. But part of what I set out to do with this challenge and blog was to… “blog and gain some followers and possibly help other people”. So far I am failing on the regular blogging and getting followers. My posts have been erratic and some might say lack quality. So coming up on the final week of January, I have three goals this week. #1 is to end the month strong to ensure I get my average step count up closer to 11,000 per day. (I am only at 9,700 average) #2 is to try and spend more time trying to gain followers. #3 is to do at least 3 quality posts during the week. 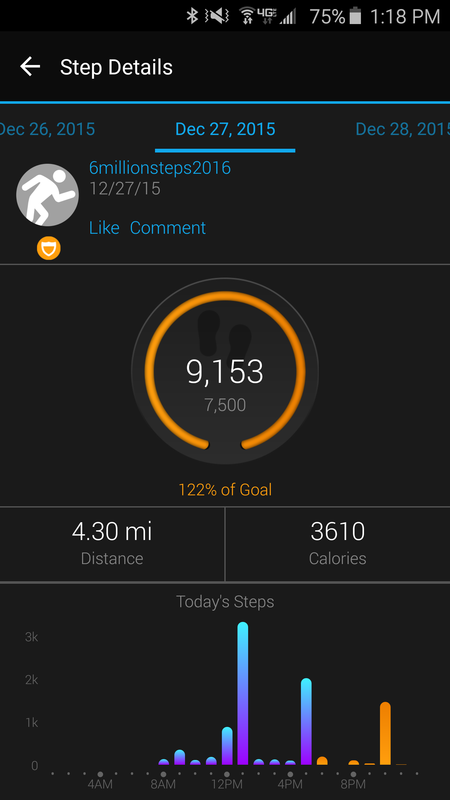 So for those whom like numbers here are my step counts..
1/24/2016 10,000+… day not over yet.. Despite having a bad weekend of walking, I have had DETERMINATION. This picture was determination yesterday when I walked 2 miles in lake effect snow. I actually walked in the snow earlier in the day for a mile then this picture later at 8pm. I have rebounded nicely from the weekend low step counts to put up three 12,000+ step days. Determination is something that at times might waver but true determination will conquer. Although I am only 14 days into this challenge I believe in my determination and believe I can succeed. Determination has also helped me loose 7 lbs in the first 13 days of the year. What do you need more DETERMINATION to do?? Think about it, I would love to hear your comments..
OOPS.. Forgot to post the other day.Overall have been good. With being back to work and trying to get in steps I have forgot about posting. As you can see from the picture I have been doing OK with getting in steps and trying to get my daily average to about 11,000 steps during the month of January. One thing that is becoming more and more apparent is that I will have to really work on getting my steps up into the 20,000 step range for the summer so that I can make up the ground I am loosing right now and next fall into winter. Currently it is taking walking during my lunch and at least an hour at night to get to the 9-10,000 step range. This means that by summer I will need to be walking about 2-3 hrs out of my day!!! Nothing else interesting really to say today… Hope everyone is having a good first week of 2016… 7 days in 359 days to go. First day back to work…Ugh. Hey it is also freezing outside!! Yesterday’s step count wasn’t bad at 9,201. Today though with this cold and being back to work getting steps means going to the gym. With work and even a quick lunchtime walk my step count is only 4,000 steps. World Gym here I come…One treadmill, 60 min, 3 to 3.5 mph please. I am planning to walk “6 Million Steps in 2016”. So what’s the plan you ask?? Well the general plan is to spend some more time at the gym, and doing a few different GPS games that I partake in. They are Munzee, Geocaching, and Flagstack. The biggest thing will just be the time and doing things like walking around the mall a few times, having my wife drop me off somewhere and walking home, and maximizing every opportunity I can to get steps in. This last five days I have been trying to average 7,500 plus steps a day to prepare to start this challenge today. I was able to succeed with this very well, despite cold weather by going to the gym and doing some Munzee activities. This was an average step count of 9,327 per day for the last 5 days. So the plan is that over the month of January to average about 11-12 thousand steps per day and each month of the year continue to bump the average up until I am averaging 17,000 steps a day in the summer. During the week Monday through Friday I will only be sharing small little posts of step counts or small stories of the day. On Saturday’s I will do a re-cap of the week, goals, step count, etc. I ask you to join me on this journey. However you wish to join is up to you… Follow me, walk your own journey, share your own resolutions, share your life events, etc. Thank You for reading and I hope to get to know some people better. Here is a quick share of yesterday’s step count..